We are committed to quality & customer satisfaction. We have a highly skilled and dedicated professional staff. We have earned the Angie’s List Super Service Award for 2011. Call (973) 492-0016 to learn about our landscaping services. 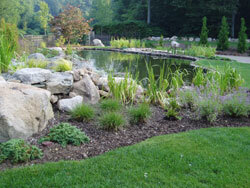 The quality of our landscaping is unsurpassed in every respect. We employ over 25 employees and a full-time office staff including designers. Our equipment and service personnel are well versed in the latest techniques and methods in the industry. This enables us to provide quality work in a safe environment.